Myrtle Beach, SC is a fantastic destination choice for a golf retreat. With a plethora of options for activities you will have plenty of options for entertainment while vacationing in the area. Golf lovers will be overwhelmed by the sheer number of opportunities available where they can enjoy their sport. Myrtle Beach is a premiere vacation location where you can enjoy championship golf courses and warm South Carolina sunshine. If you are longing for a vacation where you can enjoy amazing Myrtle Beach golf courses and wonderful accommodations, then the Grand Strand is just the destination for you. Whether you are planning a trip with a golf foursome or just a family vacation that includes rounds of golf, we can find accommodations that will suit just what you need. Stay in a luxury resort or rent a private beach house that offers awe-inspiring views as well as a close proximity to many outstanding golfing opportunities. With more than 60,000 options for accommodations on the Grand Strand there is truly something for everyone. 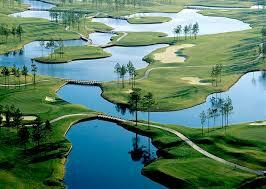 When it comes to golfing and the Myrtle Beach area you will find a plethora of choices. The 60 miles of the Grand Strand offer golfing for every skill level and budget on more than 80 Myrtle Beach golf courses. These courses are beautifully designed by top designers. Myrtle Beach is home to three of Golf Magazine’s Top 100 Courses You Can Play. The beauty of choosing Myrtle Beach for your golf vacation is that there is no need to feel overwhelmed when planning a trip to the area. If you choose a golf package all you need to do is choose your arrival and departure dates. Select which courses you would like to play and the rest of the planning will be taken care of for you. A custom designed schedule that includes all your confirmed tee times will be sent to your prior to your arrival date. If you would like to participate in a tournament during your golf vacation in Myrtle Beach plan your trip so you can join in one of the major tournaments the area boasts. Myrtle Beach is home to the world’s largest amateur golf tournament, the World Amateur Handicap Championship. This tournament has more than 4,000 participants and is played on more than 60 of the area’s finest courses each August, delivering 72 holes of intense stroke play. Participants will also enjoy nightly parties and entertainment. You may also want to plan to participate in the Father and Son Team Classic, a three day 54-hole competition. If you are unfortunate to have a day during your golf retreat when the sun isn’t shining you can find many rainy day activity alternatives such as live entertainment, the aquarium or additional indoor attractions. If you bring the family or you have a break from the Myrtle Beach golf course entertainment options include the beautiful Atlantic Ocean, amusement parks and area tours. A golf trip to Myrtle Beach will include wonderful accommodations and fantastic dining as well as innumerable attractions and activities including a great variety of opportunities for astounding rounds of golf on championship courses. Myrtle Beach, SC is a fantastic destination choice for a golf retreat.